The story follows the young protagonist, Yu Fudo (遊 不働), a character whose name literally means “Play, Unable to work”. An unemployed slacker, Yu’s life is turned upside-down when one day he is captured by the Indentured Employment Army, a.k.a. the Death March Army. Yu is in the process of being sent to labour camp when he is rescued by the Jobless Alliance, a.k.a. the Riga Jobless. Yu quickly finds himself the pilot of the Riga Jobless’s prototype mech, the Neetenberg. It turns out that Yu is a fabled N.E.E.T. 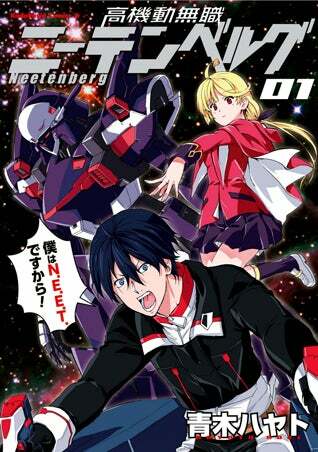 (Next Evolution Exceed Type), an evolved human, and one of the only beings capable of powering and piloting the Neetenberg. Due to the high number of topical business in-jokes, Neetenberg will probably be an utter nightmare to translate, and even if it is, much of the humor will be lost in translation or completely fly over the head of someone not in on the jokes. That said, if you are fluent in reading Japanese, and are somewhat business-savvy, and are a fan of the Gundam universe(s), Neetenberg will not disappoint. But if you meet those qualifiers…let me know how it is? just a note for this post, NEET, is probably a play on ‘Not Employed, in Education, or Training’ which is how millions of young OECD people are now described by the IMF etc, y’know, who want to help.. Thanks for the comment, Hugh! I actually knew that but forgot to mention it. Woops!